Kwanza Henderson first learned a love of fishing from his father, who passed away when Kwanza was only 5 years old. 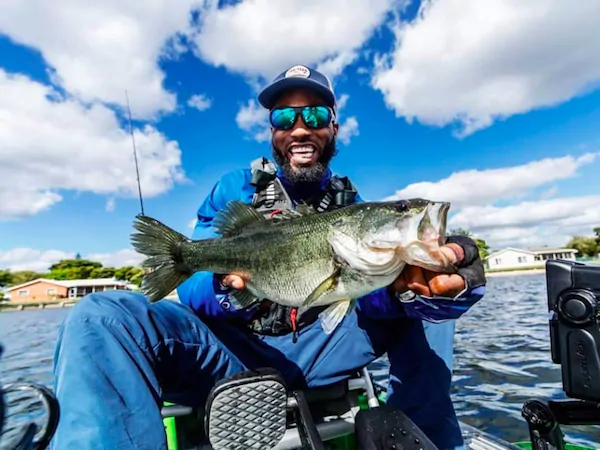 The passion for fishing stuck with the Miami-based Kwanza ever since, and became a way for the two men to connect. “When I’m fishing, whether it’s from a kayak or if it’s land, that is a time that I really get to spend time with my father,” Kwanza said in Yaktastic Adventures’ featurette We Yak Too. “Although he’s not here, but spiritually, I get to spend time with him. I speak to him, I talk to him. It’s like he never left,” he added. Like many, Kwanza started out with bass fishing. But he found his calling as an angler when, in 2007, a friend introduced him to kayak fishing. The first day he went kayak fishing, he took the kayak into freshwater, inland, and offshore. All in the same day. It was a thrill, and he was hooked. Since then, the Miami-based angler’s passion has been going after big fish in the open water. The Johnson Outdoors & AFTCO-sponsored angler regularly posts his his adventures via YouTube and Instagram. (Raymarine Axiom 7) I actually like it a lot. The 3D sonar is absolutely insane to me, and to be able to use down imaging past 300 feet of water. When I go offshore, I fish deep, sometimes 300, 400, even 800 feet of water and I want to be able to see some type of structure. I noticed a lot of fish finder companies don’t cater to kayakers because we’re not as big as the boaters, so they don’t put too much thought into the smaller units. I like the touch screen capability of the Axiom, and the details. (Old Town Predator PDL) The Predator PDL changed my life into kayak fishing. Hands-free, being able to troll offshore, not have to worry about getting tired. I never even tested a Hobie. I personally like being able to reverse without having to pull a cord. With the PDL, it’s one drive that does everything Hobie’s trying to do. It’s nothing against Hobie. I had the (Old Town) Predator XL, which had the trolling motor in the middle. I liked it, but it wasn’t practical. It was heavy, with too many heavy components. When you get in the water, it’s like a breeze, but it wasn’t practical. And then, are you even kayak fishing anymore? And then you have to charge this, charge that. It’s too much. With the PDL, it’s just the kayak and the drive. That’s it. I have two GoPros. I have a GoPro 5, the black series. I named one of my cameras “the action camera” which sits behind me because you see everything. I also have one that says “the front camera.” Let’s say I’m fighting a sailfish and I want to get it jumping, I’ll turn the camera around using the YakAttack portrait mount, and then turn it back around and take a picture of myself. My video setup I like to do 1080 with 60 frames per second, or a little higher. If you get something jumping, man, you want to get something as slow as possible and make it smooth. (DJI Mavic Pro) I have a drone but I don’t use it to search for fish. To me, that just takes away from the hunt. I’m a hunter; that’s what I go out there for. I would never really put it up in the air fighting a sailfish. Drones only last at the most 25 minutes. The average fighting of a sailfish is 30 minutes or so. I use people, haha. I have good friends who go out more than I do, and I ask them, “Hey, anything biting?” I’m just old-fashioned when it comes to that. I like technology, but not for fishing. Once you become tech-savvy for fishing, it takes away from the love and the passion for the hunt. Featured image courtesy Kwanza Henderson on Instagram.